All moving machines have rotating axes. Those axes are supported by bearings. Of a wide variety of bearings available, Minebea’s greatest strength lies in miniature ball bearings with external diameters up to 22mm. Ball bearings use the low-friction rolling of balls to realize the smooth rotation of the shaft and the efficient transmission of kinetic energy to the various parts of the machine. This contributes to energy savings, longer life and reduction of breakdowns for the machinery. A precision of the bearings is linked directly to a precision of the machinery. Ball bearings consist of four components – an outer and inner ring, a retainer, and the balls. 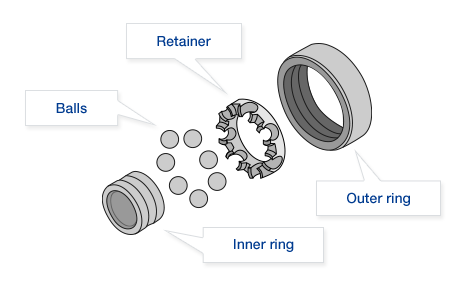 The outer and inner rings support the rotational motion, the balls reduce the friction from that rotational motion, and the retainer keeps the balls in place. Lubricant is also added to make the movement even smoother, and some form of shielding is applied to prevent the lubricant from leaking. 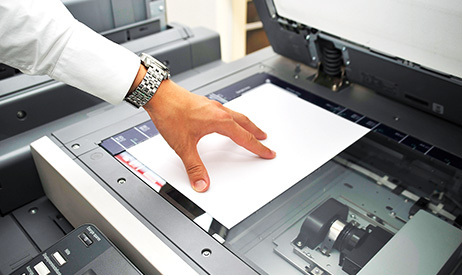 Multi-function copier-printers used in offices and other situations use many bearings, which need to be highly durable and provide precise, stable motion. Bearings are certainly used in every moving product or merchandise from household electronic and electrical appliances such as printers and vacuum cleaners to automobiles and medical devices. One could even say that it would be impossible to operate these machines without bearings. Moreover, as machines have become increasingly downsized in recent years, demand for smaller, higher-precision bearings has grown. The miniature ball bearings born of Minebea’s ultra-precision machining technologies are contributing greatly to the manufacturing industry all over the world. Minebea started its life as Japan’s first specialised manufacturer of miniature ball bearings in 1951, and bearings have remained a primary focus of its business ever since. Our bearings are tiny components of just a few dozen millimeters in size, but they represent an aggregation of the technology and know-how that Minebea has cultivated for more than half a century. World’s smallest steel ball bearing capable of being mass produced was born of Minebea’s passion for ultra precision. Although it is tiny, its precision and performance are comparable with other bearings. These bearings are being installed in Japan’s finest mechanical watches, and we expect their applications to expand into a variety of fields and products in the future. The use of tiny at just 1.5 mm in diameter, in a variety of applications is expected to grow in the future. Polished to the nano-level Ra (surface roughness). The smooth rolling motion of bearings is highly dependent on the precision of the balls. Balls that may look smooth at first glance can be found to have rough surfaces when examined with a microscope. To minimize frictional resistance to the greatest extent possible, Minebea bearings are fitted only with ultra high-precision balls that have been polished to the nano-level Ra (surface roughness). Balls that underpin the precision motion of the bearing. They are meticulously polished to reduce friction resistance to the minimum extent possible. Along with its ultra-precision machining technologies, another of Minebea’s strengths lies in its mass-production capabilities. Even if a company is able to make the most high-precision products, unless it can provide a steady supply of those products to the market, it will be unable to support the manufacturing industry. In particular, with numerous ball bearings often used in a single piece of machinery, the ability to mass-produce this “staple of the industries” is essential. Ultra-precision machining and mass production technologies have been cultivated by the development and manufacture of ball bearings. As of March 2016, Minebea has an external sales target of an astounding 180 million ball bearings a month. Taking an example of our 22-mm diameter product, if that many ball bearings were stacked one on top of the other, it would produce a column of around 3,960 km in height. 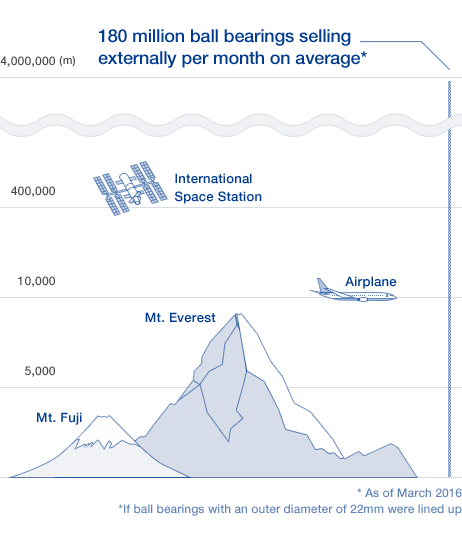 That is high enough to extend beyond the earth and reach out into the space. This ability to produce ball bearings and supply them to the global manufacturing industry in such astonishing quantities is one of Minebea’s major strengths. With Minebea’s vertically integrated production system, all processes, from design and development through to assembly and testing, are conducted in-house. For Minebea to create systems for ultra-precision machining and mass production of ball bearings, it was vital to ensure that it would made improvements at the component and production equipment levels. While it is common for manufacturers to purchase various components from external suppliers, Minebea, in its quest for precision of its product parts, moved to in-house manufacture of all its components. It also made its own modifications and innovations to purchased production equipment and jigs to achieve efficient mass production. This process of trial and error fostered a culture of in-house manufacture in Minebea, as well as its vertically integrated manufacturing system, which controls all processes from development through to manufacture and testing. There are many different varieties of production system, each of which has its own advantages and disadvantages. Minebea decided to introduce this vertically integrated manufacturing system so that it could focus uncompromisingly on its pursuit of ultra precision and ensure a steady supply of its products as a bearings manufacturer. All aspects of production, from design and development to the manufacture of each component, the production of jigs and tools to make those components, right through to the assembly of components, are performed in-house. It is thanks to this system that Minebea has been able to achieve its ultra-precision machining and mass production technologies. Every single process in the manufacture of ball bearings is imbued with Minebea’s passion for ultra precision. System extended to overseas production bases and other businesses. Minebea has also extended the systems that it has cultivated in the course of the development and manufacture of ball bearings to the company’s other businesses, where they have made major contributions to the development and manufacture of products other than ball bearings. That know-how has become a major driving force in Minebea’s current globalization and business diversification efforts. Minebea’s single-minded dedication to the ultra-precision has given the company its major strengths of ultra-precision machining technologies and mass production capabilities, while at the same time, the dedication to ultra-precision continues to underpin the global manufacturing industry.